No Man’s Sky got a lot of slack when it was first released, and I mean a lot. So much so that they went silent on Twitter for months on end after it’s initial release. However the game has seen significant improvements with every new update, there’s no denying that. In the latest update, which was the Path Finder Update (1.2), we saw many new features added to the game. Obviously, one of the most major features of the Path Finder update was the Exocraft. Allowing you to drive vehicles around your planets. Other features included base sharing, improved visuals and character specialisations. 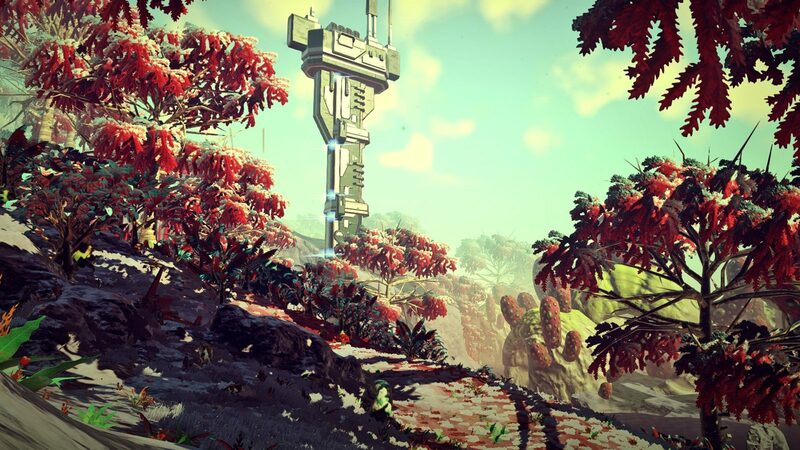 We definitely see a brighter and improved future for No Man’s Sky. The 1.3 update is confirmed to be coming in August, with the end of the Waking Titan ARG, and we’re all super excited. There are so many features we hope to see come to No Man’s Sky. The suggestions below are just ideas we’d love to see, and we understand that the guys at Hello Games more than likely have a completely different vision for their game. This was obviously a given. In countless amounts of interviews, multiplayer was brought up by Hello Games founder Sean Murray. Specifically stating that No Man’s Sky did indeed have multiplayer, but the game was so big that nobody would ever find each other. Unfortunately, players did in fact find each other. Within the first 24 hours of the games release to be precise, bringing a lot of excitement and anticipation. Sadly, when the two users met on one of the planets, they weren’t able to see one another. Adding multiplayer to No Man’s Sky would bring a huge boost to the player base, increase sales and improve the game further. The thought of playing with friends, building bases, flying together and exploring new worlds is extremely exciting. Also, imagine Exocraft races? In all honesty, the creatures in No Man’s Sky aren’t that bad. Sometimes you get the occasional derp. However most of the time, you do get unique creatures that have their own animations and sounds. Although when we look back to the original Gameplay trailer from E3 2014, we see complete opposites. They look amazing, we see two giant creatures sitting in the lake. The creatures almost look like they have their own behaviours and such, but in the final release this is missing unfortunately. 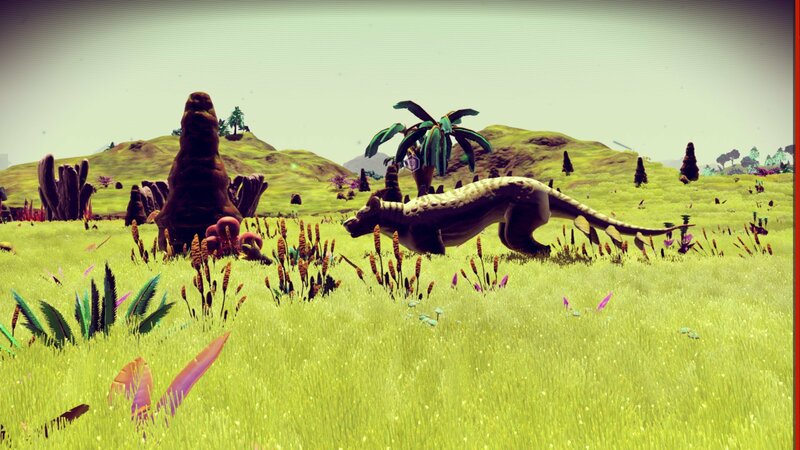 In a future update, if we did see more creatures of various sizes and personalities, that would be a major improvement. It would help bring the game to life, and make exploring planets that much more rewarding and exciting. I currently feel in No Man’s Sky, there aren’t enough random encounters. When flying through the galaxy or around planets, I’d like to bump into some characters who’d want to give me a side quest, or lead me on a journey. It seems every NPC in No Man’s Sky has the same interactions, just trading or learning parts of their language. What if you received a warning about an incoming meteor to a planet you’re currently salvaging, and you have to evacuate? Or enemy pirates swoop down to your planet to plunder your base. Seeing crazy scenarios and encounters play out like this would be interesting. You wouldn’t want it to happen every hour or so, they’d have to be relatively rare events to keep you on your feet. When you first load into a new save on No Man’s Sky, it would be great if you could customize your character in a way that you want to. Even choosing a faction to start with. Even though there is currently no third person view in game, creating a character model and design would go hand in hand with multiplayer which we discussed above. It could also possibly allow Hello Games to implement a third person view if the player chooses. As well as this, you could create a name for your character and use it to build on relationships with the various species in No Man’s Sky. When exploring planets, if would be great to go into major faction areas, such as housing or cities, even if they’re miniature. As well as this, when exploring the surface it would be great to get lost in huge, dense forests. Trading posts are always deserted and look the same, whilst all bases are also similar. It would be great to see them be more unique and not offer the same thing each time, so the game isn’t as repetitive. The Constructs mod helps with this, by adding various structures to a lot of planets. Some of a huge scale! Seeing Hello Games expand on this mod/idea would be great, and I’d love to see what they could come up with in the future. More populated places: Space Stations, bases and trading posts should all be populated with life forms of all different kinds. More biomes: When exploring a planet, it feels the same throughout. Including different biomes with unique weather and storms would help make it more interesting. Space stations: They all look relatively similar still, maybe make them unique to race. With the Path Finder update, we do see more species inside now, making them more lively thankfully.